Twitch is a social network dedicated to streaming that is growing quickly. If you want to attract new leads, this platform can be very useful for your digital marketing strategies. In this post, I will try to explain all its advantages and the reasons why you should create an account on this platform if you intend to improve brand image. 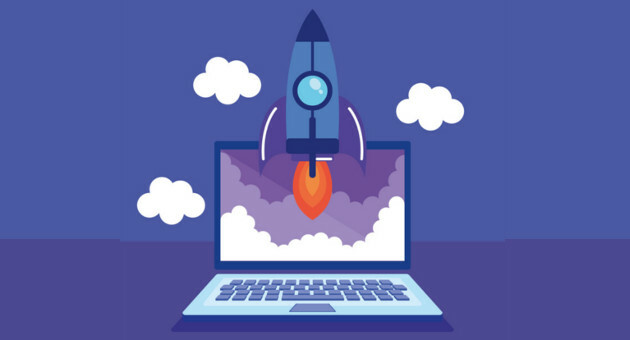 Maybe you don’t know yet, but Twitch is one of the social networks that is growing and it may offer some advantages for your digital marketing strategy. Youtube is very popular, as millions of users are watching videos on the platform every minute. However, other platforms are offering different solutions and attracting new users. I also have a YouTube channel, because I need to release information to my subscribers and promote my personal brand. In fact, I’ve already written about the importance of Youtube on this blog. However, YouTube is not the only social network. There are others like Twitch. And, precisely, today I want to explain to you why you should create a channel on this platform and, of course, why you should publish your content on this social network. 1 · What is Twitch TV? 2 · Can we work with another topic on Twitch? 5 · How to increase visits to your Twitch channel? 6 · Can we create an email marketing strategy with Twitch TV? 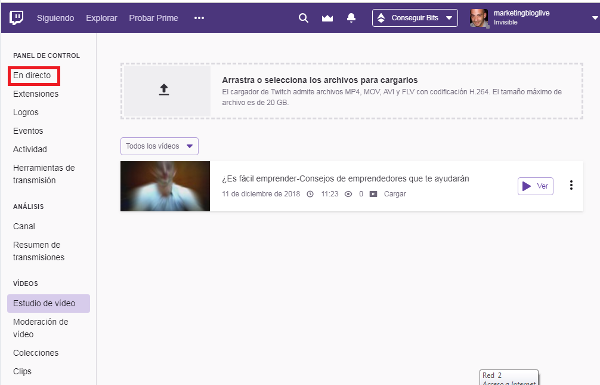 7 · How to upload videos to Twitch from a PC? 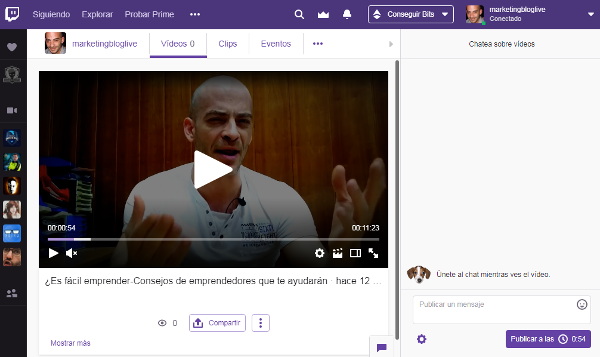 8 · How to make live streams on Twitch? · What is Twitch TV? Twitch TV is a social network that allows you to make live videos, although you can also send normal videos as you do on YouTube, Vimeo or Dailymotion. Currently, most of the channels on this portal are focused on Gaming and apparently many of the channels are getting fantastic results without the need to have as many subscribers as on other social networks. I know personally cases of people who have only 600 subscribers, but who are already making money. They are not living exclusively from this social network, but it is a prelude of what you can gain if you create relevant content constantly. Although I already told you in advance that to make the most of this platform, you should consider working with streaming. If most channels are about games, would it be worth creating a channel on a different topic? This question is natural and I will answer it now. · Can we work with another topic on Twitch? It makes some sense to think that there is no room for other topics on Twitch, if most channels talk about video games. However, if you think so, you are wrong. We can find channels of other themes in this social network, in many cases with better results than on Youtube. An example would be Romuald Fons’ Twitch channel which, although it is a channel focused on SEO, has thousands of views. The funny thing is that this channel only has 4 videos published. Of course, he knew how to use this portal very well, that is, while explains concepts about web ranking, he is playing a video game. You could do the same thing or be even more original. What you need to understand is that yes, you can create a successful channel on this social network. With this, I am not saying that with two or three videos you will get spectacular results. Actually, I’ll explain why this user got so many views. But if a channel on SEO works, you could create a channel related to motorsport, health, diet, etc. However, to give you an idea, Twitch TV has an advantage over YouTube that can make a difference in streaming live videos. It seems difficult to see an advantage that could make the difference when compared to YouTube or other similar platforms. But there is indeed a significant advantage. And what is this advantage? Well, you will hardly have any competition. In fact, depending on your industry, you could be practically the only person who deals with the subject in that language, so you could become an influencer on Twitch TV. This is a very remarkable fact, considering that it is so difficult to become an influencer on Youtube for new channels. If you search for a keyword on YouTube, there are so many channels addressing the same topic that it is difficult to rank a new video. However, with Twitch TV, the opposite will happen to you. 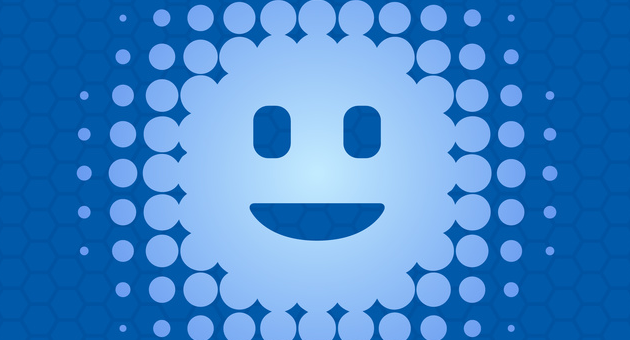 Do you still think it’s not worth having an account with this social network? Well, wait a minute, because I still have more to tell you. Twitch TV has other advantages. Unlike YouTube, you don’t need as many subscribers to create a profitable channel. To clarify, I will tell you some additional advantages that this site offers when compared to YouTube. Do you want to see them? Well, keep reading. If you become a Twitch partner, you can make money from the ads displayed on your videos right away. On other platforms like Youtube, you need to work with very strict rules to be eligible to participate in the monetization program. Also, you’ll be able to define when ads are displayed to your viewers. Yes, there are advertisers on Twitch. And if there are advertisers, you can make money with your videos. This feature is available for this platform for users to not leave videos they I want to keep watching. Users will pay for that, and you can receive a percentage of the money the platform earns with Bits. So you already have another alternative to monetize your content. You can create a paid channel on this platform like you can do on Youtube. If you select these options; users will have to pay a fee to subscribe to your channel and watch your videos. But there is an exponential difference between this option and Youtube. While on YouTube you need to have 100,000 subscribers before you can create a paid subscription channel on Twitch, you can start charging for your content from the first video you create. Do you like these advantages? I think so. I also believe they are fantastic. But you can do much more than that if you don’t want to be just another influencer. There is much more to tell you about this system. So read on. 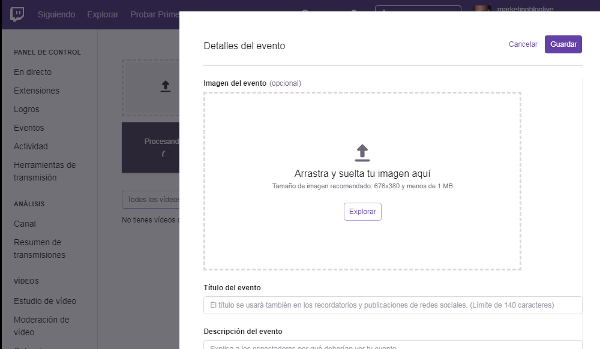 · How to increase visits to your Twitch channel? 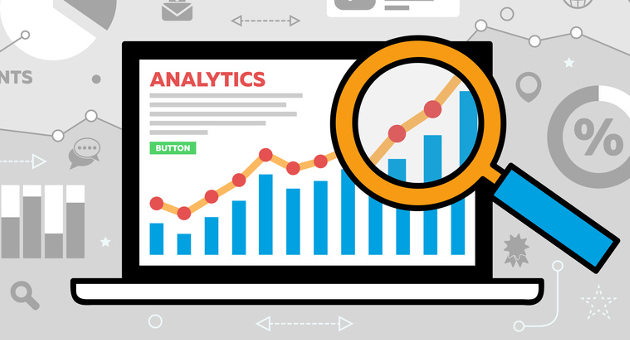 Now that you have this information, you’re probably planning how to increase the number of visits to your channel. Although it is not easy to attract traffic, you have resources to improve the virality of your videos. If you act immediately, you won’t have to wait for people to discover — your channel. First of all, you should create relevant content that users won’t find on free channels if you want to ask for their money. Otherwise, they will never accept to pay for the content. To get started, you can upload two or three videos from your computer, and once you have subscribers, you can start working with streaming. This way, you will have more content to share and attract new subscribers to your channel. Also, you can use your website and blog to advertise your channel. Your visitors are your first target for increasing the number of Twitch subscribers because they already know your brand, especially recurring visitors. So you can create an email marketing campaign to capture potential viewers interested in watching your streaming videos or write a post inviting users to sign up. 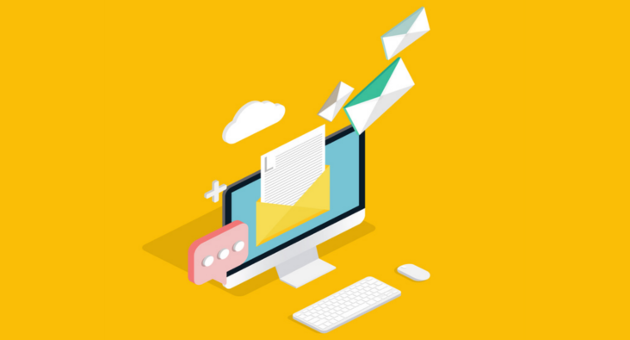 Of course, as in any email marketing campaign, you need to offer something in return, if you want to convince users to subscribe to your channel. You should also invest some money in ADS because it is one of the best alternatives to increase the number of followers quickly. Think that investing in Facebook ADS is profitable because its prices are very competitive, unlike other more expensive platforms. So, for a minimal cost, you can get great results. And finally, if you have a YouTube channel, you can direct your subscribers to Twitch. This is precisely what Romuald Fons did. That’s why the number of views is so high. I think with these four formulas; you’ll be able to increase the number of subscribers on your channel. · Can we create an email marketing strategy with Twitch TV? If you already have a fair number of subscribers, you can create an email marketing strategy for your online business. 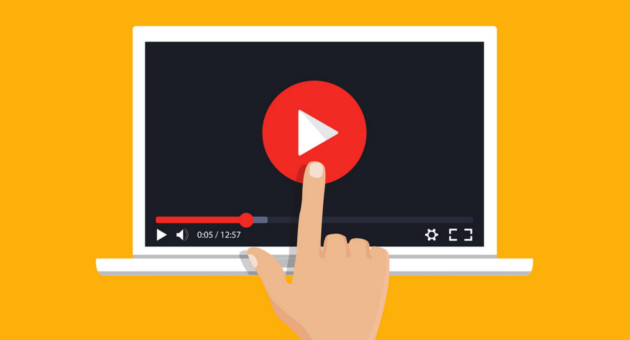 What’s more, knowing that you can stream videos, you can increase your email list because you can interact with your subscribers in real-time. And what does that mean? In a nutshell, you can promote engagement with your target audience. Once you convert your viewers into subscribers, you can apply the same strategy you already use on your Youtube channel. In fact, now that I think about it, imagine the number of subscribers you can attract if you work with Youtube, Twitch and your blog simultaneously. Of course, don’t forget to add content regularly because you need to feed your subscribers with relevant information to keep them engaged. If possible, you should work with streaming, as this is the differential of this platform. However, now what you need to know is how to add videos in this platform. I’ll explain how to do that in a few steps. 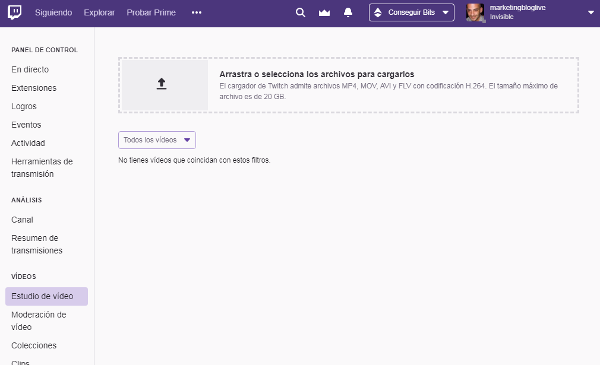 · How to upload videos to Twitch from a PC? Initially, it can be very confusing to import videos for your channel, as it seems that this platform doesn’t offer this option. This is one of the negative aspects of this interface in my opinion. But don’t worry because I’ll explain step by step how you can import your videos to your channel. 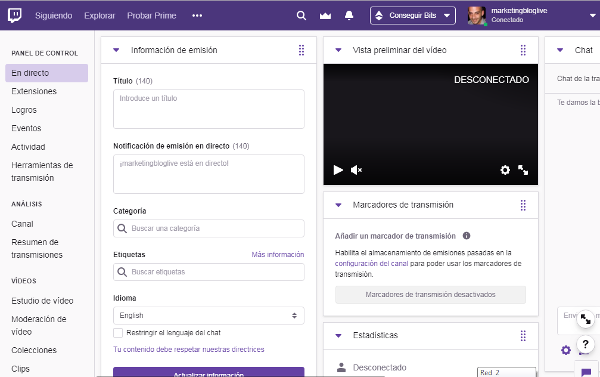 · How to make live streams on Twitch? Twitch offers so many options for professional streaming that we would need to write another article just to talk about all the aspects that you should consider. In this post, I’m just going to talk about the most basic aspects, but if several users are interested, in the future, we can write another article explaining how to create videos about gaming on this social network. Click on your profile photo and under “Video Studio,” exactly as in the previous example. These are the most basic aspects that you should consider. However, the platform has other interesting options, such as clips, collections, video moderation, streaming tools, and many other features. We will talk about this in other articles. I hope I have helped you with this post. Do you use Twitch? What do you think of this platform? Interesante la idea y el artículo. Hola Jonatan. Gracias por tu aporte. Me parece muy interesante que exista una red social diferente a las tradicionales, porque es muy interesante que podamos contar con alternativas, ya que eso hace que cada red social se esfuerce por tener siempre una calidad excelente y sobre todo que no existan monopolios. Tu artículo es muy informativo y claro y digno de compartir.